“To be able to officially welcome Air France to Glasgow Airport today is fantastic – both for the city and our customers. Air France is a major player in the world of aviation with an extensive route network through its hub at Paris Charles de Gaulle into important global markets such as South America, China, India and Africa. “The arrival of Air France’s inaugural Paris flight into Glasgow is a significant boost for the city’s economy. Securing France’s national air carrier and the introduction of a direct daily, year-round service will further strengthen cultural and business links between Paris, Glasgow and the wider west of Scotland. 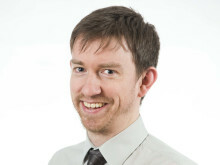 There will undoubtedly be strong demand for this service, which has the potential to deliver considerable inbound leisure and business tourism. 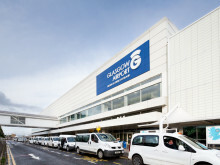 “We are delighted to welcome the launch of Air France’s direct service from Paris-Charles de Gaulle to Glasgow Airport. The romance of its dramatic landscapes and the richness of its culture and traditions make Scotland a popular destination for visitors from France – currently one of our biggest European markets and set to deliver strong future growth. Glasgow, too, is increasingly becoming a must-visit destination for the French traveller, combining the cultural vibrancy of city life with the stunning scenery of Loch Lomond & The Trossachs National Park right on its doorstep. 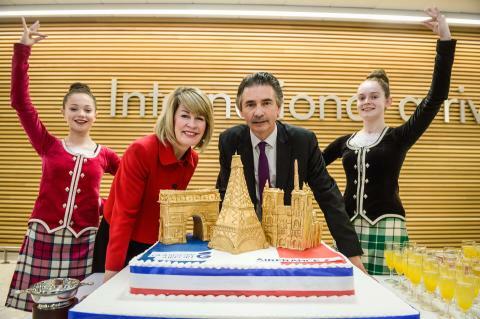 Picture caption (please credit Nick Ponty): Glasgow Airport’s managing director Amanda McMillan and Henri de Peyrelongue, Senior Vice President Europe Air France celebrate the launch of the new route with highland dancers at Glasgow Airport.